The NBS disclosed yesterday that Over N400 billion was paid out to public officials as bribes in Nigeria between June 2015 and May 2016. According to the report computed by the National Bureau of Statistics, NBS, the highest incidents of bribery occurred during encounters with the police, though the bribe received by policemen was often below the average bribe taken by public officials. While nearly one out of every two encounters with the police led to one form of bribe or the other, the report further puts bribe-taking to be more prevalent among judicial and law-enforcement agencies. 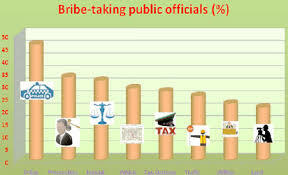 The rate of bribe-taking spread with prosecutors at 33 per cent, closely followed by judges and magistrates, at 31.5 per cent; car registration/driving licence officers (28.5 per cent); tax and Customs officers (27.3 per cent); road traffic management officials (25.5 per cent), public utilities officers (22.4 per cent) and land registry officers (20.9 per cent). The report immediately received strong reactions from some strong public commentators, including Alhaji Abubakar Tsav, former Commissioner of Police and Second Republic lawmaker, Dr. Junaid Mohammed, who said it was indicative of the fact that corruption was still pervasive, despite the change in administration. Prof. Itse Sagay, Chairman of the Presidential Committee on Anti-Corruption, however, described the report as vague, saying he could not comment on it. In the report titled, “Corruption in Nigeria: Bribery – Public Experience and Response 2017”, NBS also noted that bribery was not limited to the public sector, as there were cases of corruption in the private sector as well. “Taking into account the fact that nine out of every 10 bribes paid to public officials in Nigeria are paid in cash and the size of the payments made, it is estimated that the total amount of bribes paid to public officials in Nigeria in the 12 months prior to the survey was around N400 billion, the equivalent of $4.6 billion in purchasing power parity, PPP. This sum is equivalent to 39 per cent of the combined federal and state education budgets in 2016. Bribe-payers in Nigeria spend an eighth of their salary on bribes. “The average sum paid as a cash bribe in Nigeria is approximately N5,300, which is equivalent to roughly $61 – PPP. This means that every time a Nigerian pays a cash bribe, he or she spends an average of about 28.2 per cent of the average monthly salary of approximately N18,900. Since bribe-payers in Nigeria pay an average of 5.8 bribes over the course of one year, 92 per cent of which are paid in cash, they spend an average of N28,200 annually on cash bribes equivalent to 12.5 per cent of the annual average salary,” the report stated. NBS also noted that almost one-third of Nigerian adults paid bribes when in contact with public officials within the survey period. “Almost a third of Nigerian adults (32.3 per cent) who had contact with a public official between June 2015 and May 2016 had to pay, or were requested to pay, a bribe to that public official. “The magnitude of public sector bribery in Nigeria becomes even more palpable when factoring in the frequency of those payments, as the majority of those who paid a bribe to a public official did so more than once over the course of the year. “According to the survey, bribe-payers in Nigeria pay an average of some six bribes in one year, or roughly one bribe every two months. On average, almost one bribe is paid by every adult Nigerian per year. “By combining the total number of people who paid a bribe to a public official with the frequency of those payments, it is estimated that a total of roughly 82.3 million bribes were paid in Nigeria in the 12 months prior to the survey. “This results in an average of 0.93 bribes paid per adult, or almost one bribe paid by every adult Nigerian per year,” NBS added in the report. NBS further stated: “As elsewhere, corruption and bribery in Nigeria are not only limited to interactions between the public and public officials, but also take place between the public and employees of private sector entities (businesses). “Nigerians experience bribery in various private sector exchanges when they come into contact with employees in the private sector with a certain decision-making power or who can provide access to coveted goods or services. “These can include, admission to a private school; preferential school grades; favourable treatment in private hospitals in exchange for a payment that personally benefits a nurse or doctor; access to a bank loan that may otherwise be denied or to avoid thorough controls in the insurance sector. “The vast majority of bribery episodes in Nigeria are initiated either directly or indirectly by public officials (85.3 per cent) and almost 70 per cent of bribes are paid before a service is rendered. “With such a large portion of public officials initiating bribes, which are paid up front, it seems that many public officials show little hesitation in asking for a kickback to carry out their duty and that bribery is an established part of the administrative procedure in Nigeria. “The survey shows that a large proportion of bribes in Nigeria (42 per cent) are paid to speed up or finalize an administrative procedure that may otherwise be delayed for long periods or even indefinitely, thus making bribery the most effective option for facilitating that service. The second largest proportion of bribes (18 per cent) is paid to avoid the payment of a fine, a frequent request in citizens’ encounters with the police, while 13 per cent of all bribes are paid to avoid the cancellation of public utility services, an indication that the provision of the most basic amenities, including water and sanitation, can be subject to abuse of power by public officials in Nigeria. Police officers are the public officials to whom bribes are most commonly paid in Nigeria. Of all adult Nigerians who had direct contact with a police officer in the 12 months prior to the survey, almost half (46.4 per cent) paid that officer at least one bribe, and in many cases more than one since police officers are also among the three types of public official to whom bribes are paid most frequently (5.3 bribes per bribe-payer over the course of 12 months) in Nigeria. “Although fewer people come into contact with judiciary officials than with police officers over the course of the year, when they do, the risk of bribery is considerable: at 33 per cent, the prevalence of bribery in relation to prosecutors is the second highest, closely followed by judges and magistrates, at 31.5 per cent. The experience of corruption in encounters with public officials whose duty it is to uphold the rule of law can lead to the erosion of trust in public authority. “Other public officials with a high risk of bribery include car registration/driving licence officers (28.5 per cent), tax and custom officers (27.3 per cent), road traffic management officials (25.5 per cent), public utilities officers (22.4 per cent) and land registry officers (20.9 per cent). This shows that corruption takes place across a number of different sectors of the public administration and that certain public officials have a disproportionate impact on the daily lives of Nigerians,” the NBS survey reported. For the main survey, NBS said a total of 33,067 interviews were conducted across the 37 states with persons aged 18 and older. “The sampling methodology adopted is a stratified random sampling, with a stratification process conducted at the state level. Stratified random sampling is a sampling method that requires dividing the population into smaller groups (or strata) and drawing a randomized sample within each stratum. “In this case, the strata are represented by the 37 Nigerian states (36 states and the Federal Capital Territory) and within each state, the (adult) population was extracted randomly. “In each of the 37 states, between 779 and 900 interviews were conducted. To make survey results at the state level representative at the national level, for the analysis of the data after the survey, the sample size was adjusted (“weighted”) for the size of the population in each state. “Weighting ensures that the distribution of the sample across states reflects the actual distribution of the population,” NBS stated. In his reaction, second Republic lawmaker, Dr Junaid Mohammed, said: “It is unfortunate that these monies are not only entering individuals hands but it is also moving out of the country. However, I am not surprised about the statistics released and if they are to be believed, then all we are being told about anti-corruption war is just a farce.